– Citadel – or the Old Pechersk fortress, a monument of architecture of military engineering. It is part of the museum complex “Kyiv Fortress”, being one of the largest stone and earth fortresses in the world. It represents fortifications of the XVIII century, built on the basis of the Pechersk Monastery. In 1679, to strengthen the defence by decree of Hetman Samoilovych around the monastery appear moats and earth ramparts. In 1706, in connection with the need to strengthen the city in case of an attack by the Swedes, the Pechersk citadel was laid on the basis of the Lavra. Hetman I. Mazepa financed the construction of new structures – a stone wall with four towers. By 1711, the citadel, surrounded by 8-meter brick walls with loopholes, became an impregnable fortress, in which the Vasylkiv Gate (west), the Kyiv Gate (north) and the Moscow Gate (south) were included. During the XVIII century the Old Pechersk fortress was constantly being completed, serving as a base for administrative and military institutions. The citadel, opened from the Dnipro side by earthen ramparts with bastions, had two circles of fortifications, preserved to this day. The first is the defensive walls around the monastery, the second is the ramparts (the Park of Eternal Glory), the “Mystetsky Arsenal” (“Artistic Arsenal”), the fortress walls (Naberezhna Road), the Moscow Gate and the powder cellars (Lavrska Str.). Since the beginning XІX century the construction of the New Pechersk fortress begins. 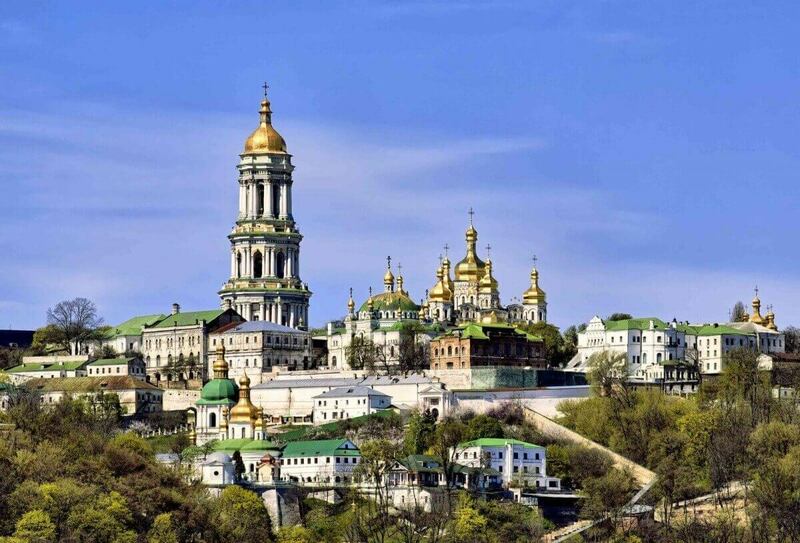 – Kiev-Pechersk Lavra – was founded in 1051 by the monk Antony, who settled in the caves of the future Pechersk Monastery. In 1062 the monastery was called Pechersky. Since the end of XI century the territory of the monastery begins to complete . In 1679, to strengthen the defence by order of Hetman Samoilovych around the upper monastery appear moats and earthen ramparts. In 1688 the monastery was given the status of the Lavra. 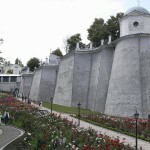 In 1706, when there was a need to strengthen the city in case of an attack by the Swedes, the Pechersk citadel was laid on the basis of the already existing fortifications of the Lavra. 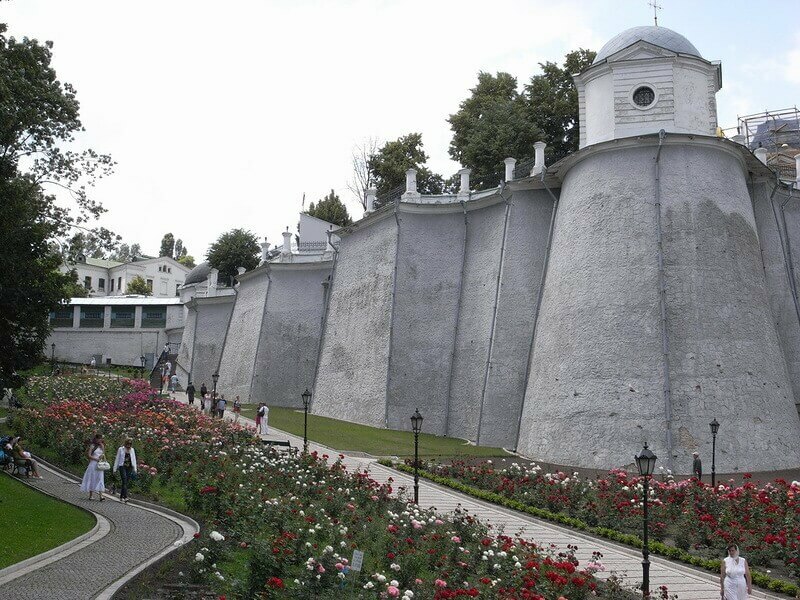 The Kyiv-Pechersk Lavra becomes part of fortifications, and by 1723 – the central construction of the impregnable Old Pechersk fortress, which consisted of a semi-circular citadel with ramparts and various fortifications. – Mazepa walls with towers – walls of the Upper Lavra with five towers and several entrance gates, including those with gatehouses built in 1698-1701 at the expense of I. Mazepa. They served as a defensive part of the monastery and were part of the fortifications of the Kyiv fortress. The stone walls had a height of 7 m and ended with battle galleries. Two-tier towers with loopholes supported the line of walls. To present day preserved Onufriievska, Malyarna, South and Ivan Kushchnik’s towers. The earth rampart up to 6 m high surrounded the Lavra in a semicircle, taking into account the natural protection from the Dnipro. The wall rests against the gate church of All Saints, built by I. Mazepa at the same time as the walls and served as an entrance tower. In the south-western part of the wall is the Clock Tower, which was designed to defend the southern part of the fortress walls. The tower of Ivan Kushchnik as a watchtower was also part of the fortification system of the monastery. At first it was two-tier. The lower tier was meant for defence. The upper tier was built in 1718-1727. Onufriievska Tower is located in the south-eastern part of the fortress walls and resembles the church of All Saints. In the event of a siege, defensive actions could be taken from the tower. The tower retained only the main architectural features. The Malyarna tower (height – 8 m) is located in the north-eastern part of the fortress walls. It served as a clock tower. In the XVIII century here was the school of painting, hence the name of the tower “Malyrna”. In 1838 it was rebuilt and preserved in this form to the present day. – The former plant “Arsenal” – is a historical and architectural monument located on the former territory of the Old Pechersk Fortress (Lavrska Str., 10-12). Originally in 1750-1763 there was a wooden building to accommodate in it workshops for the manufacture of ammunition, parts for guns and its repair. In 1764, the construction of a brick plant began, in which a cannon yard was opened, where guns and artillery equipment were repaired and manufactured, and so on. The factory served the artillery of the Pechersk fortress and the fortifications of Kyiv. The production premises of “Arsenal” served not only as workshops, but also as a weapons warehouse. “Arsenal” as a fortification structure of the Old Pechersk Fortress served as a defensive fortification – it could accommodate up to 2,000 men and 2,000 pood of gunpowder in barrels. In the 1830s The Old Pechersk Fortress lost its defensive role and became a production and warehouse complex. But “Arsenal” has not lost its importance and by the beginning of the World War I it had a strategic and defence significance, fulfilling military orders for the entire Russian Empire. During the World War II, the south-eastern corner of the building was destroyed. In 1979, “Arsenal” received the status of a monument of architecture and military engineering. Until the late 1990s was in the department of the Ministry of Defense – there was a Kyiv repair plant (until 2009). Today in the historic building of the “Arsenal” plant is the museum complex “Mystetsky Arsenal” (“Artistic Arsenal”). 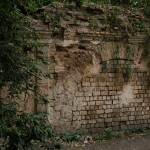 – The fortress wall around the Far and Near Caves – was built in 1844-1848 with loopholes for shooting from rifles and embrasures for cannons, embrasures were closed with wooden flaps (Blyzkopecherska Str.). Repeating the terrain, the wall with two open semi-circular towers covers the territory of the Far and Near Caves, separating the lower part of the Pechersky Monastery from the urban development on the south and south-east side, from the western one – from the Hostynny Dvir, and from the north – connecting with the walls of the XVIII century. The length of the wall is 1039 m, the thickness is 3.5 bricks, the height is up to 4 m. There was no battleground on the wall, so wooden racks were built to place the shooters, if necessary. A fragment of the wall has preserved. In 1972 it was restored in its original form. – Moskow Gate – an architectural monument, the southern entrance to the Old Pechersk Fortress. It consists of the Upper and Lower Gates. The Upper Gate in the form of a triumphal arch was built in 1765, through which the road led to Moscow and the Left Bank (Lavrska Str., 22/1). The Lower Gate, located just below the Upper Gate, in the transverse shaft of the retrenchment, was built in 1779. They are vaulted tunnels flanked by facade walls. The gates are preserved and have undergone reconstruction. 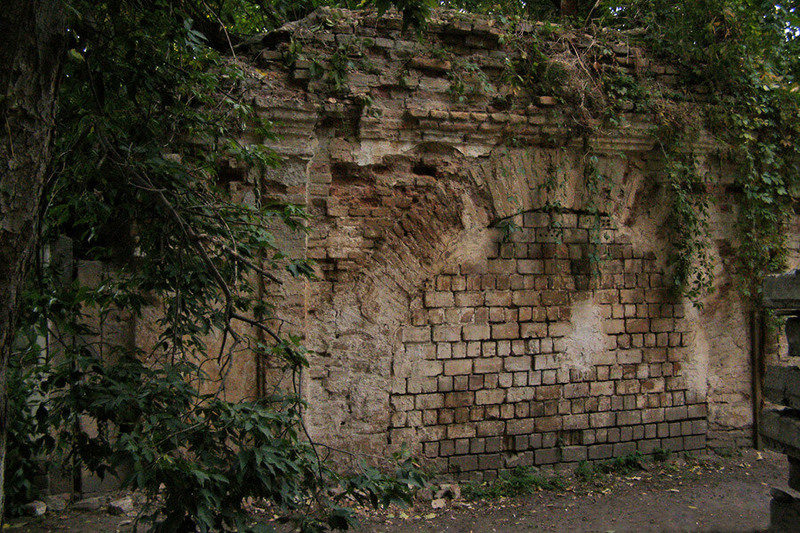 – Powder cellar (restaurant “Tsarske Selo”) – fortification structure of the Old Pechersk fortress, built in 1749-1751, the cellar of the Oleksiivsky bastion. It is located on the territory of the Citadel between the Pavlovsky Bastion and the Malyarna Tower (Painter’s Tower) (LavrskayStr., 22). It is a brick one-storeyed cellar with blind walls and a semicircular vault, in the composition of the facades – deep niches in the form of arches. It was used for its intended purpose and only at the beginning of the nineteenth century was filled up with the construction of new fortifications. In the 1980s reconstruction was carried out at erection of a memorial complex. The structure has survived to the present day. 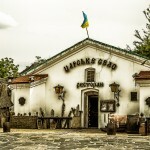 Today in this building there is a restaurant of Ukrainian cuisine “Tsarske Selo”. – Vasylkiv Gate – erected in 1755 and served as a western entrance to the Old Pechersk Fortress, an architectural monument. It consisted of the main and ravelin gate. Until now, only the ravelin gate with a facade facing the courtyard (Tsytadelna Str., 3) have been preserved. At the moment the gate is in an abandoned state and requires urgent reconstruction. 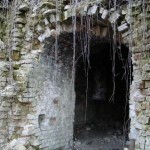 – Powder cellar – built in 1749-1751 years. (I. Mazepa Street, 17). 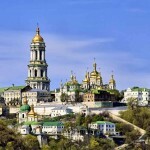 It is located on the territory of the Citadel of the Kyiv fortress between the Pavlovsky bastion and the Malyarna tower of the walls of the Kyiv-Pechersk Lavra. Built according to the design of the military engineer D. Debosquette. Brick one-storeyed, elongated rectangle with blind walls and a semi-circular vault throughout the length of the structure. The facades of the cellar in the form of arches are divided by twin pilasters on the side walls. Used for the purpose, holding the territory of the monastery under the constant threat of an explosion. During the Great Patriotic War it was used as a warehouse. 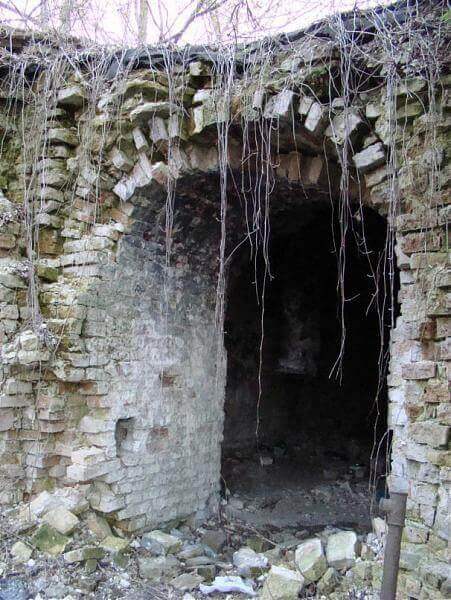 Today, the cellar is an abandoned vaulted structure without doors with an entrance to the side wall. 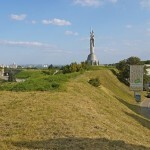 – Earth ramparts of the Kyiv Citadel. From the time of the Old Pechersk Fortress, Kyiv received the Pechersk relief. 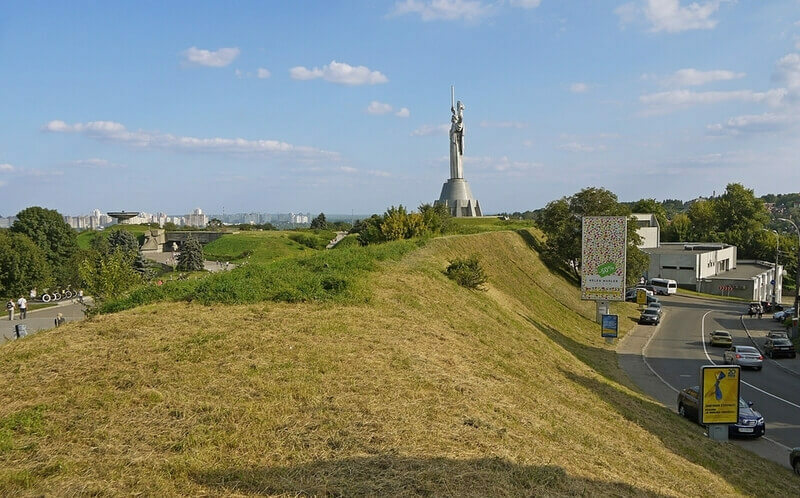 This is almost all irregularities in the territory of the current Park of Eternal Glory, the Museum of Ukrainian History of the World War II and nearby places – parts of the so-called Petrivsky Val.